Deciding to get a dog is a big deal. Not only will you get a powder keg of playfulness and epic cuteness, you will also experience “puppy moments.” These include anything not stored away or protected being chewed, trash not secured being gotten into and likely, many house-training mishaps. 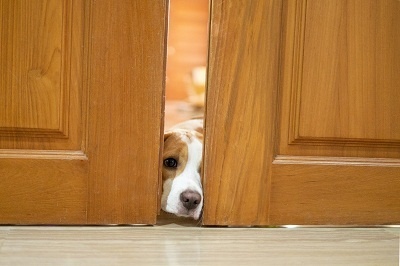 Even installing a custom dog door in Orange County, CA, will not stop your bundle of energy from getting into a lot of potential trouble, both with you and in terms of their own safety. Here are some suggestions to minimize the latter part of that reality. You must think of puppy proofing as a task as challenging as child-proofing your home, just with a more resourceful adversary. Kids will stop if they run into an insurmountable obstacle; puppies will double down and start scratching and chewing. Puppies can get into a lot in a very short period of time. That means you must install childproof latches on your cabinets and it is a good idea to put any cleaning supplies, medications, and cosmetics out of reach. You also will have to secure garbage can lids or even ensure they are safely secured behind a closed door. Puppies will chew just about anything. Because of that, you must conceal all cables and cords as well as tie up any blind pulls. Anything chewable, such as shoes or clothes, have to be stowed away in closets at all times. Blockade anywhere a puppy can become stuck, including closets, under beds and behind electronics such as television. A good idea is to get down at the puppies’ level and scan their living area to see if there are any items that are chewable or sharp objects they can hurt themselves with. The energy puppies have is also nothing short of amazing. One pup can knock just about everything in a room askew in a matter of seconds. Because of that, make sure you have secured things that can break if the fall or could hurt the pup if they drop on him. Lamps, books, and keepsakes should be either safeguarded out of the pup’s reach or secured. Heavy objects on bookshelves should be store away until the pup settles down or removed from anything more than the first two shelves. You may be tempted to install a dog door in Orange County, CA, but while your puppy is still very young, this is asking for them to escape. If you do find dog doors for sale in Orange County, CA, remember that your puppy is probably not close to its final size and you do not want to have to replace a door once the pup is completely grown. Apart from delaying getting a dog door, you should also closely inspect any fencing you have and look for holes in the fencing as well as a way for the dog to tunnel underneath it. There are a lot of other things you can do, including making sure your puppy has a space of their own for sleeping, but generally, the above list is a good starting point. Adhering to it will keep your pup safe, which means, when the time comes, once they have grown older and settled down a bit, you can invest in a custom dog door in Orange County, CA, and have the peace of mind your puppy will be able to navigate it safely.